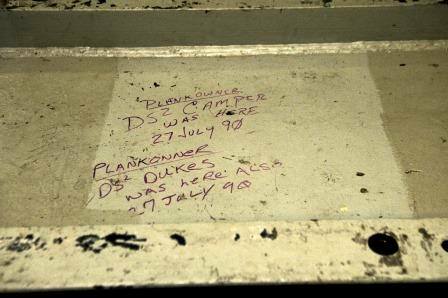 Plankowners made their mark on the aircraft carrier Abraham Lincoln more than two decades ago. Sailors on the aircraft carrier Abraham Lincoln opened a time capsule of sorts last month and didn’t know it. While performing work connected to the refueling and complex overhaul Lincoln is undergoing at Virginia’s Newport News Shipbuilding, sailors assigned to the ship’s combat systems department found the signatures of two sailors on the carrier’s original deck plates while they were removing tiles. The plankowners made their marks less than a year after the ship’s 1989 commissioning. A picture of the signatures went up on the ship’s official Facebook page shortly after the Oct. 23 find. In a social media success story, one of the autographers, Data Systems Technician 2nd Class Tim Dukes, saw the post and shared his memories. The carrier’s midlife refueling and overhaul, which was delayed six weeks by budget concerns, began in late March and is expected to last 3 1/2 years. The $3.3 billion effort will keep the carrier in service another 25 years. When I was a 2 digit midget I started leaving a little symbol in hide a way spaces. A message in a bottle drawing in all kinds of places that you normally wouldn’t like, like the overhead of a crawl space. A few years ago a shipmate e-mailed me and reminded me of those. After I left and a few were noticed, some of the guys got together and tried to find as many as they could, they found 27, but I tagged at least 50 or more. I wish I had thought of doing that. I was one of those who were the first Chiefs after LINCOLN was commissioned 11/11/89. We lost our “Crows” in the Chief’s Mess on Sept. 13, 1990. It was both a difficult and great time in my life. I’m very proud of the ship and wish her and her future crews fair winds and following seas.